When I was a kid I was a big fan of Robin Hood, King Arthur and Tom Sawyer. I loved reading books about those characters and movies about them as well. I was also young so I saw Disney’s Robin Hood as a kid and I remember it fondly. I loved the characters and animation. The music and stories were fun. I received a copy of this movie on Blu-ray/DVD/Digital Copy to watch and review. Opinions about it are 100% my own. I was able to share it with my kids and was so happy to see that Eva enjoyed the movie. She even drew me a bow and arrow to cut out and use. I should have known that Eva would have liked the movie because of the bows and arrows. She is a big fan of the Disney Movie, Brave and so her heroic character reference is Merida. Seeing Robin in the bow and arrow tournament was fun. I loved all the disguises and the wily way that Robin Hood got out of tight spots. Watching that movie now after seeing it so long ago and seeing so many other Disney movies over the years it was tough not to draw some parallels. For instance the personification of Prince John felt very much like Scar from The Lion King. The voice, the intonation and more was so similar. While Scar was way more dangerous he was very much like Prince John in deposing Mufasa and being a terrible, terrible king. Unfamiliar with Disney’s Robin Hood. Here are some details on the movie and the 40th Anniversary Blu-ray set. Join Robin Hood, his trusted companion Little John and his hilarious band of Merry Men as they outfox greedy Prince John to save the good people of Nottingham. Dashing from one daring deed to the next, Robin won’t rest until he wins the hand of Maid Marian and restores King Richard to the throne. 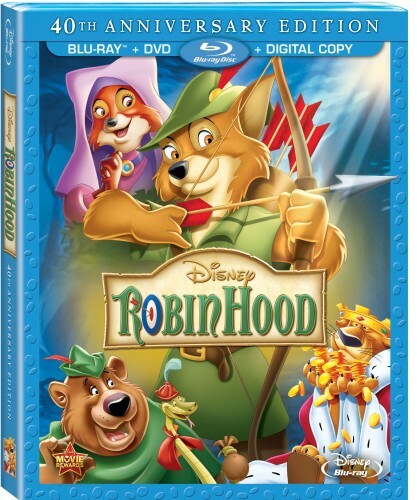 One of Disney’s most beloved movies is even better on Blu-ray Combo Pack! Here are a couple more clips from the movie. Be on the lookout for this movie in stores August 6, 2013.